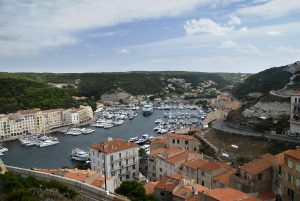 Separated from the Costa Smeralda of Sardinia by the Strait of Bonifacio, be sure to cruise into the harbor of Bonifacio while on a crewed yacht charter along southern Corsica and northern Sardinia. 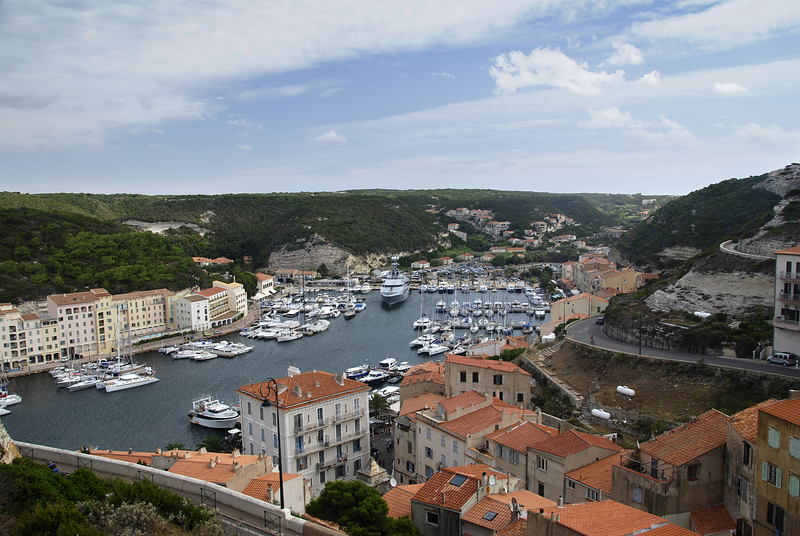 With a natural harbor that cuts into the towering surrounding chalk and limestone cliffs, the area of Bonifacio has been settled for centuries, and today offers a well protected harbor area overlooked by a medieval walled town steeped in history for a great stop on a crewed yacht charter in the Corsica and Sardinia yacht charter location in the Western Mediterranean. 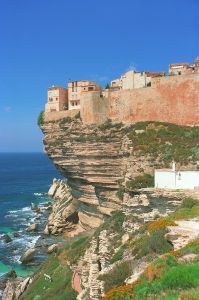 When cruising along the Strait of Bonifacio, look at the top of the striking chalk cliffs to see the walled medieval city of Bonifacio perched just at the edge of the cliffs, overlooking the natural harbor. 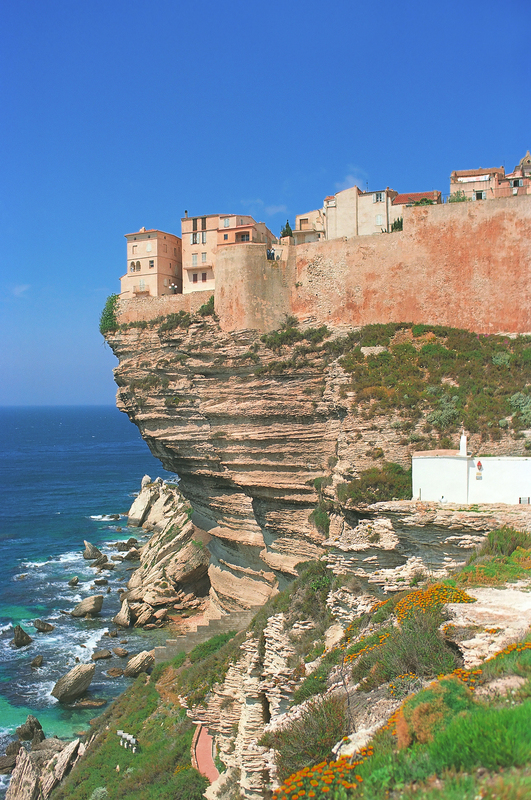 After coming into the harbor of Bonifacio, it is just a short walk up the hillside to the gates of the old city surrounded by great fortification walls originally built in the 9th century. It was the State of Tuscany, part of the Kingdom of Italy that left the largest mark on the face of Bonifacio, named for the Margrave of Tuscany, Boniface II, and builder of the original fortification walls around the city. 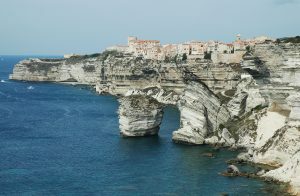 Today Bonifacio is a town on two levels. Surrounding the harbor is a vibrant area filled with shops, restaurants, cafes, and chic bars with an active night life. This harbor side area is an attractive little village in its own right with quayside restaurants with tables right on the edge of the harbor serving very fresh seafood. However the piece de resistance is the older fortified medieval walled city, Old Town, sitting high above the harbor town, on the top of the surrounding chalk cliffs. Built to protect the natural harbor and surrounds, today the fortified walled Old Town sits high on the top of the chalk cliffs, overlooking the harbor, with buildings virtually teetering on the edge of the cliffs high above the sea below. Old Town is a busy labyrinth of little alleyways and historic buildings inside the fortification walls. 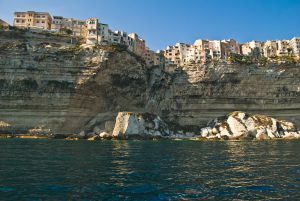 Walk up from the harbor area via the steep Monte Rastello and the Monte St. Roch steps, next to the Eglise St. Erasme, to access the Old Town through the Porte de Genes (Genoa Gate) in the fortification walls at the top to wander the many little alleyways of town. To the right of the Porte de Genes is the Bastion de L’Etendard, which is the only surviving part of the original fortification walls built by Boniface II. 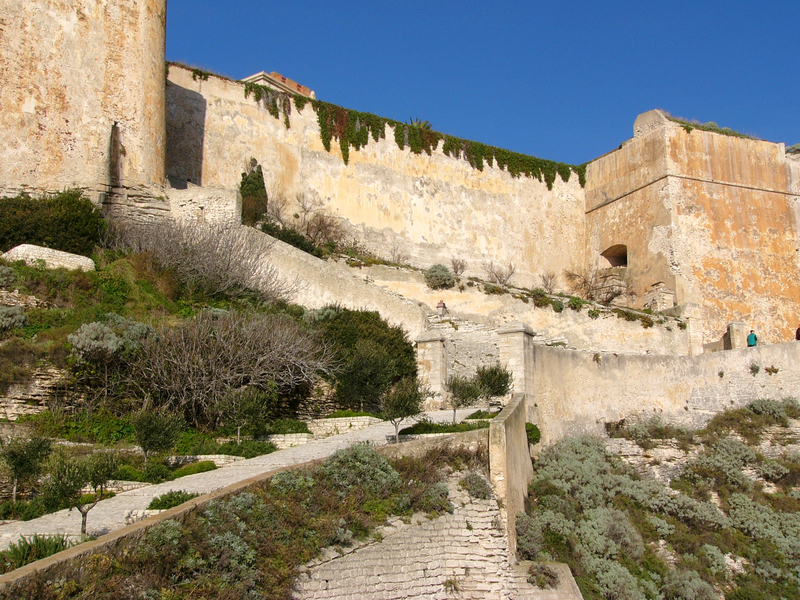 There is a small museum and also an entrance within the museum to access and walk upon the battlements for extraordinary views and photo opportunities. 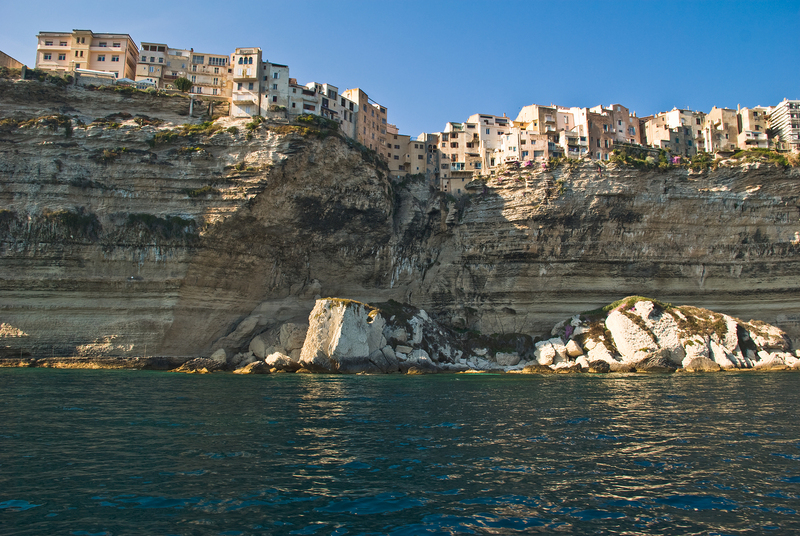 Bonifacio was truly built for safety, as the oldest houses on the streets can be found without front doors on the ground level. Under siege, inhabitants would climb up ladders from the street to the second floor entrances, and pull their ladders up behind them. And the main church in the Old Town, Eglise Sainte Marie Majeure, built in the 12th century, sits on top of a huge cistern fed by rain water gathered from flying buttresses built all over town to collect water in times of siege or drought. Inside, interspersed throughout the historic old buildings, are chic shops, and restaurants. Bonifacio is a great stop on a crewed yacht charter for either an afternoon or overnight to explore and enjoy both levels of this town, while on a yacht charter cruise along the southern coast of Corsica.